Florida U.S. 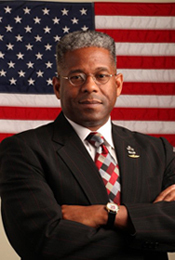 Congressman Allen West, a strong Tea Party supported conservative Republican has fought some hard battles in his life, as a U.S. Army officer in combat zones including in Operation Desert Storm, Operation Iraqi Freedom, and later in Afghanistan. His awards for brave, valorous and meritorious service are too many to mention. Congressman West’s bravery extends beyond the battlefield: as an African-American Republican he stands strong for conservative principles in the face of relentless attacks by Democrats and liberal organizations and officials. West’s current battle is to demand a fair and accurate count of the votes in his bid for re-election to the U.S. House of Representatives representing Florida’s District 18. Late on Election night, Congressman West led his opponent by 1,700 votes, but is now 2,000 votes behind his Democrat challenger. The Democrat National Committee spent major resources to defeat Allen West this time around, and is still pouring resources into the battle. St. Lucie County, Florida is one epicenter of the recount battle, and after Tuesday’s vote, only one precinct in that county had less than a 113% turnout. Yes, you read that correctly—more than 100% of eligible voters cast ballots. In that county, the "unofficial vote count is that there were 175,554 registered voters and 247,713 votes cast." That’s an average of a 141.10% turnout. In the face of this level of patently obvious chicanery, the St. Lucie County Canvassing board announced it would hold an emergency meeting starting this Sunday (November 11th) to recount all early voting ballots. Follow the latest on Allen West’s fight to get a fair and accurate vote count in Florida, by visiting Allen West’s Facebook page here. West has bravely stood up against the Democrats in Washington and for Americans who love freedom, and we need to stand with him now! Republicans of the thin-skinned variety are probably already wishing that West would drop the fight, and worrying that challenging election results will look like sour grapes or unjustified finger-pointing. But if evidence of voter fraud of any kind goes unchallenged and “uninvestigated,” then there simply is no point in campaign speeches and messages, and no point in the whole election process. Fair and honest elections have to be the starting place of political activity in America. Kudos to Allen West for fighting for fairness! Read Debbie Georgatos' book: Ladies, Can We Talk?